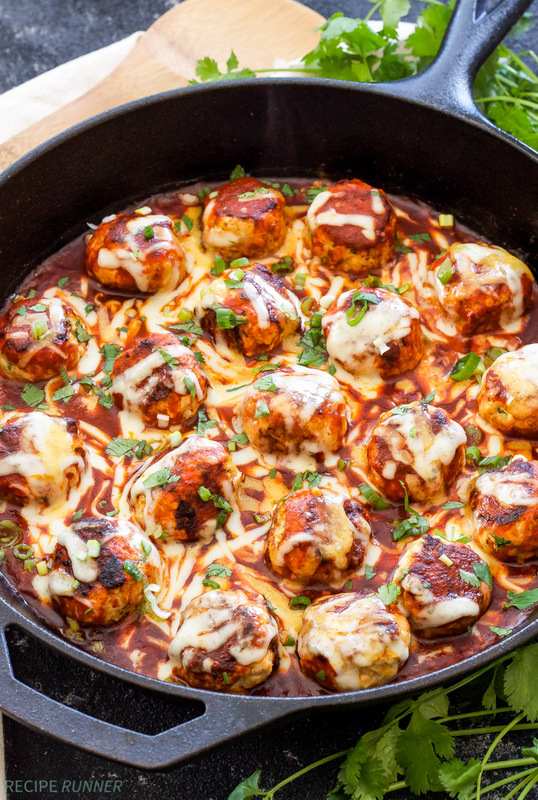 Turkey meatballs seasoned with Mexican spices, browned in a skillet and topped with enchilada sauce and lots of cheese! 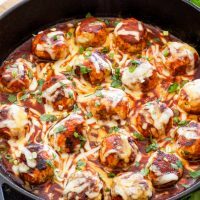 These Skillet Enchilada Meatballs are the perfect solution when your craving hassle-free Mexican food! Happy Friday! Any plans for the weekend? Nothing much happening here, just enjoying another warm sunny weekend. My husband is taking advantage of it and playing golf all day on Saturday, which leaves me with the day to myself. I really wish I could get started on my vegetable gardening, but I know I should wait because more than likely we’ll get another snow storm before the end of spring. I also have big plans to turn our deck into a place we want to spend a lot of time out on this summer. We started making some improvements to it last weekend when we bought a fire pit and a new grill, our old grill finally bit the dust. Now I just need to add a ton of potted flowers and succulents, lights and an outdoor rug to go under our table and chairs, sounds like I just found my project for Saturday. 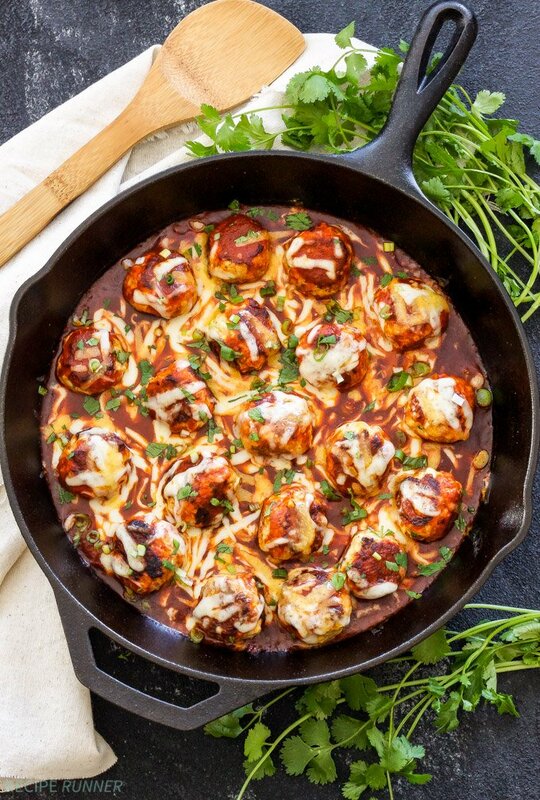 Enough chit chat about my not so thrilling weekend plans, let’s talk about these Skillet Enchilada Meatballs! 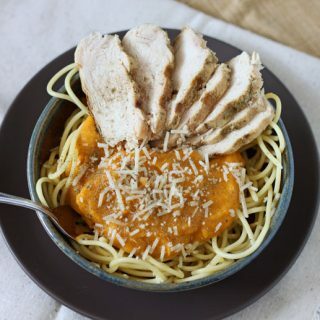 I’ve been sharing quite a few skillet and one pot meals lately because generally they are easy to make, less dishes to wash and you guys seem to enjoy them. 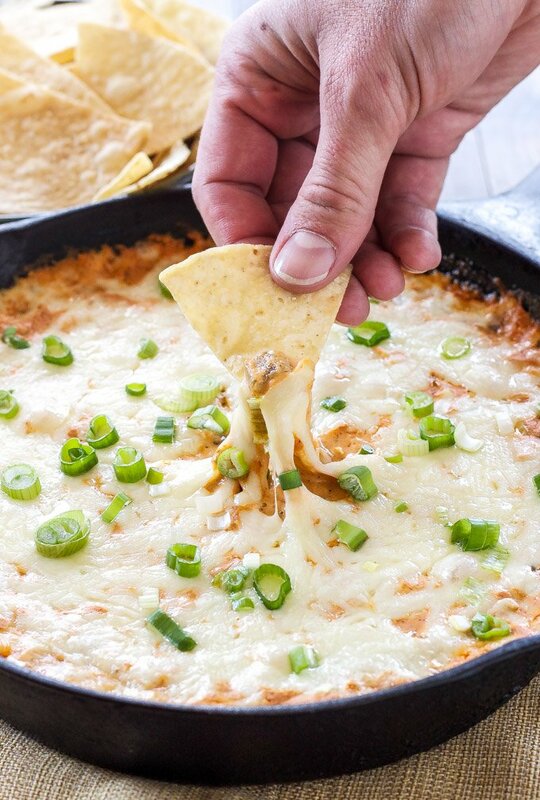 Some of my most pinned recipes on Pinterest are skillet recipes and they are also the ones I make over and over again. 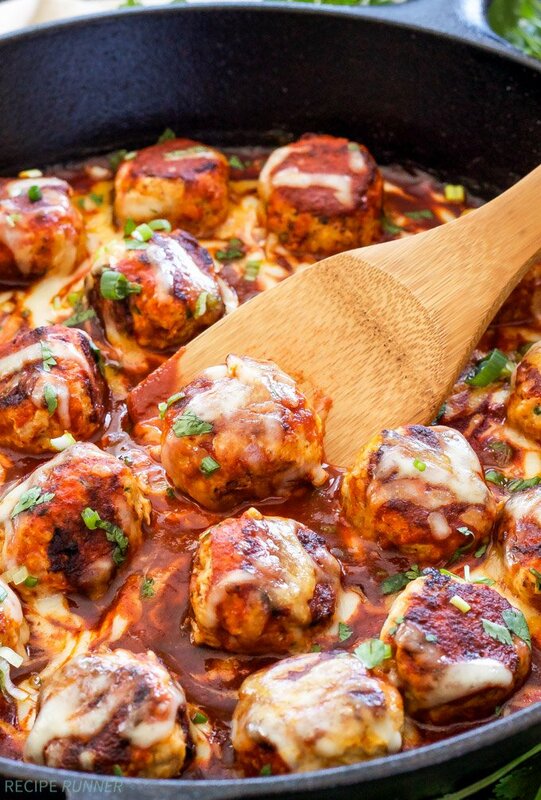 I made these Skillet Enchilada Meatballs last week when I got my weekly craving for Mexican food. I decided instead of making traditional enchiladas which involve all that filling, rolling and baking, I’d make it easy and take all those flavors and stuff them into a meatball. 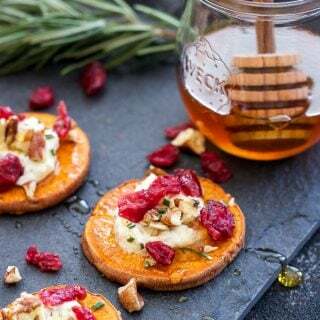 I love creating new twists on enchiladas if you haven’t noticed, I have several creative alternative recipes on the blog that give you that enchilada flavor you love without all the work. The meatballs are made with lean ground turkey and loaded with Mexican spices. They’re then browned in a cast iron skillet. I love using cast iron because it gives the meatballs a nice crust on the outside. 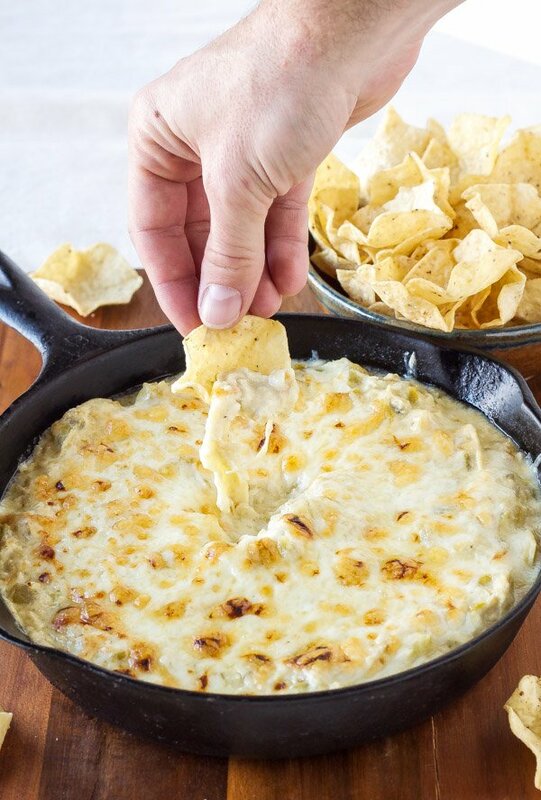 Once they’re cooked pour either homemade or store bought enchilada sauce all over them. 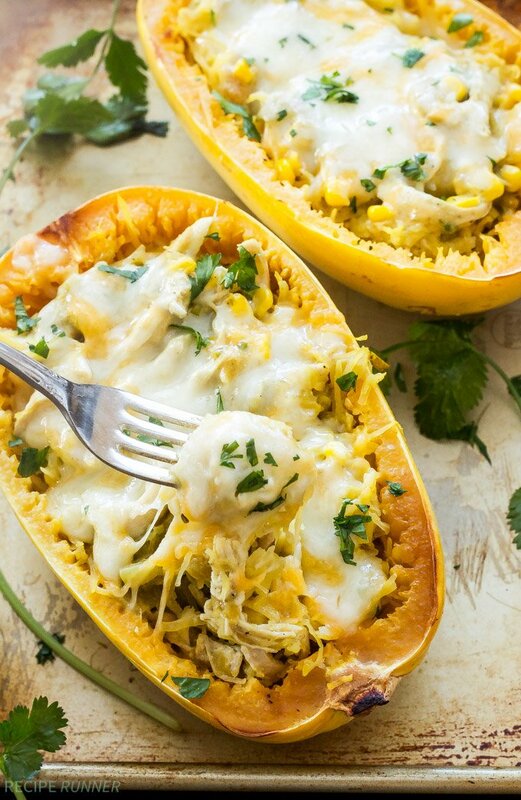 The final step is of course to top them with cheese, because an enchilada just isn’t an enchilada without cheese! 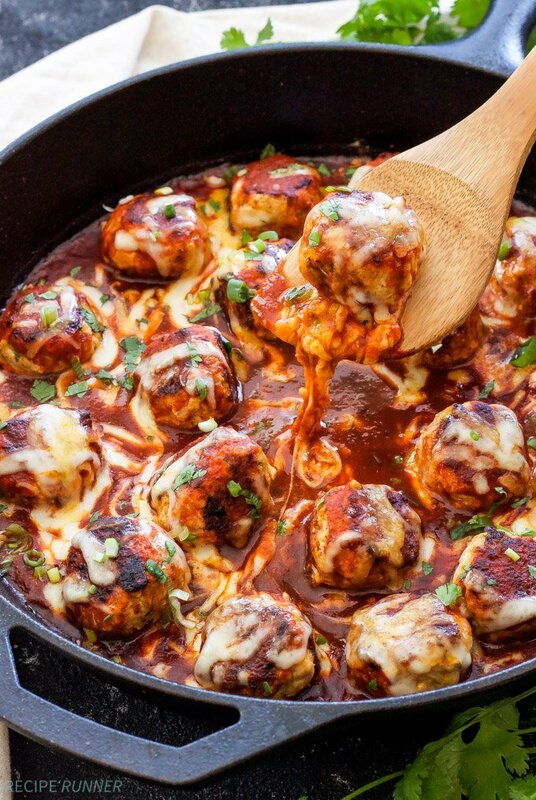 The Skillet Enchilada Meatballs turn out so moist and flavorful and are everything you expect in an enchilada without all the work! 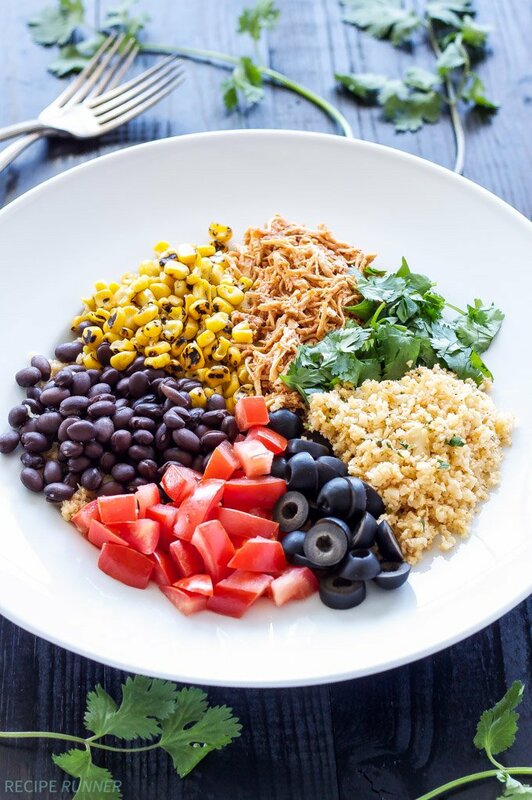 In a large bowl whisk together the onion, panko, egg, cilantro, hot sauce, chili powder, cumin, salt and pepper. Add in the ground turkey and use your hands to combine everything together, making sure not to overwork the meat. 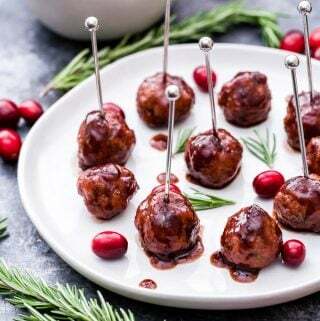 Use a cookie scoop or measuring spoon to form tablespoon sized meatballs and place them on a plate. Heat a 12 inch cast iron skillet or non-stick skillet over medium-high heat. Coat the bottom of the skillet with oil or cooking spray (generously if using cooking spray). Place the meatballs in a single layer in the skillet and cook for approximately 3 minutes on one side, then flip them over and cook for another 3 minutes or until no longer pink inside. Lower the heat to medium-low then pour the enchilada sauce all over the meatballs. Sprinkle the cheese over the meatballs then place in the oven to broil until the cheese is melted. Remove from the oven and top with sliced green onions and cilantro if desired. Enjoy your quiet Saturday by yourself :) And skillet meals are the best! Thanks Kristen! Hope you have a nice weekend as well. Wow, this looks so perfect! Love those photos, I immediately want to cook these now. Great recipe, too! Now I know what I'm having for dinner this weekend! I'm itching to get the potted herbs and flowers going too outside but consider it was FLURRYING today on my way to the grocery store I think it's still a bit too early. Spring is such a tease! Love the idea of turning meatballs into an enchilada flavored dish! Love how many ways you can make a good enchilada! Enchilada meatballs!? Why have I never thought of this!? I'm seriously drooling. My fam would go crazy over these! Thanks Karly! We loved them! These look incredible! I need to try them this weekend!